5a: Horizontal swing. Hits mid. Tends to miss crouching opponents. 5b: Saber stabs forward. Hits mid. 5c: Saber takes a step forward and delivers an overhead swing. Slams airborne opponents into the ground. 2a: Saber crouches and kicks low. Hits low. 2b: Saber does a low sweep with her sword. Hits low. 2c: Saber does a rising uppercut with her sword. Jump cancelable. Launcher. j.c: Saber does a frontal flip and brings her sword down. Slams airborne opponents into the ground. 6b: Saber takes a step forward and delivers a spinning diagonal cut. Must be blocked high. 236a/b/c: Command dash followed by a slash, 1st part of rekka series. C version goes through most projectiles. 236a: Second part of rekka series, hits high. 236b: Second part of rekka series, hits low. 236c: Second part of rekka series, hits middle. 236a/b/c: Last part of rekkas series, stuns on hit. 623a/b/c: Launcher move, c version requires meter. Press C again after 623b/c for an additional across slash, can hit on 623's whiff. A: Low. Looks identical to her 2b. B: Mid. Looks identical to her 236b. Can perform all the appropriate followups. C: Launcher, jump cancelable. Looks identical to her 623a. 236236a: Invisible Air - Saber swings her sword and a burst of air rises. Launcher. 1500 dmg. Unsheathes Excalibur, increases the overall hitstun on her attacks. 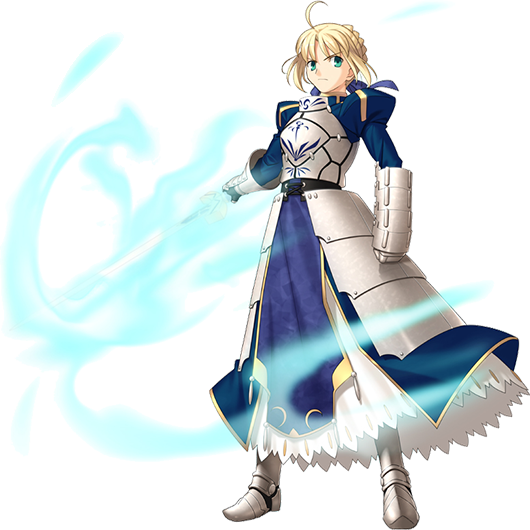 236236c = Saber slashes with excalibur before using her noble phantasm. If used to finish a match, the opponent is sent off into the sky. Different against Berserker.